Where Cursors Come From made me smile. I am so glad I finally have a good explanation for little Ella Joy. This gave me a giggle – thanks for posting! Interesting. Makes me think where the small hands come from. Oh No! Stop the decursorestation! Nice. But technically, those are mouse pointers. Tell your kids cursors are where words come from. Made me smile too! Adorable! Thanks for the smile on this rainy Monday! And Windows cursors are cut in winter time, makes sense. hahaa this is too cute!! clever! kinda reminds me of a jason munn poster. more cursors more computers more deforestation? is this a t-shirt? I’d buy one! and, I just posted the link on my FB hopefully you’ll get some other orders as well :) thanks again! I appreciate the big shout out! I should have thought about that at least once before, but no, I had to see it here. cool anyhow! Is my cursor an albino, or just painted white? These made my day hehe. My cursor is red aaaaah! 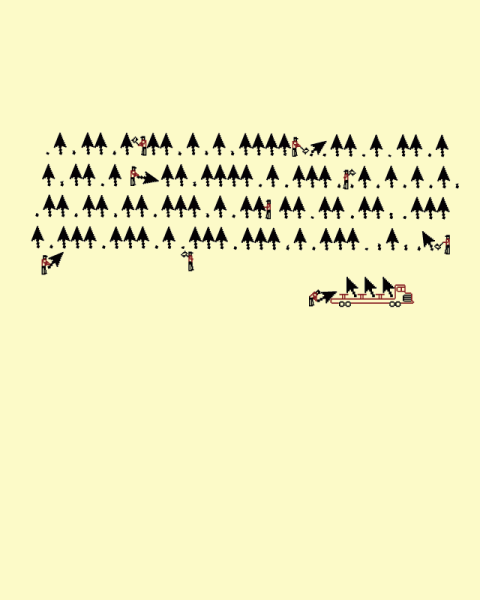 Cursors? Why, sure! Just head on up past Capslock Road and take a right into the Pixeljack Forest. Nathan W. Pyle, you’re a mad genius. You would think, teens having acne makes sense because their bodies are going through a lot of changes. But, as an adult.. I just don’t get why mine don’t go away.